RALEIGH, N.C. — Utilities in North and South Carolina are adding to the list of states in the U.S.
operate nuclear plants and say they've detected trace amounts of radiation. Protection Agency says people are exposed to much more radiation on an international airline flight. fission, at its nuclear plant in South Carolina and a Florida plant. When and how was I-131 found in rainwater in Massachusetts? evening, March 24th and confirmatory testing showed a level of 79 pCi/L of I-131. Can we expect to continue to see I-131 in rainwater samples in Massachusetts? rains in Massachusetts. However, levels will remain significantly lower and not of any health concern. Has I-131 been detected in any air samples in Massachusetts? No. Air samples collected at the same monitoring location have not detected any amount of I-131. Should I be concerned about I-131 in Massachusetts water supplies? to events in Japan. The results of both of those samples tested showed no detections of I-131. How did I-131 show up in rainwater samples but not in air samples taken? of I-131 have been trapped in cloud formation and moved across the US as part of weather patterns. Recent precipitation in Massachusetts deposited I-131 in sample collection containers. Have other states detected I-131 in their rainwater and or the air? west coast and these trace amounts of I -131 have moved east. Will DPH be conducting more tests of air and water samples for I-131 or other radioisotopes ? Will there be any testing of foods, such as milk? 4,600 picoCuries per kilogram of food product; for milk, this would be about 4,600 picoCuries per liter. is also used in medicine to diagnose and treat disorders of the thyroid gland. Once detected, how long does I-131 remain in the environment? decayed to a stable (non-radioactive) state. That level will be half again in 8 more days and so on. 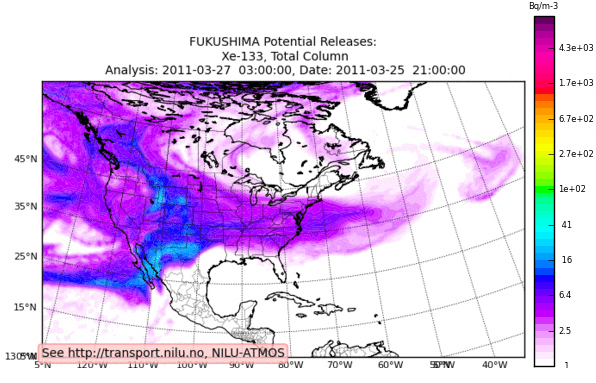 How is the radioactivity of I-131 measured?